This reserve lies on carboniferous limestone and has woodland, grassland, limestone pavement and two disused quarries providing a wide variety of habitats. The reserve is leased from Mostyn Estates and managed by North Wales Wildlife Trust (NWWT). Bryn Pydew Nature Reserve is situated between Llandudno and Colwyn Bay. From Llandudno take the main A470 road towards Conwy. Pass the sign for the Bodysgallen Hall Hotel and then at the next roundabout turn left towards the village of Segurinside. Now follow signs to Bryn Pydew, continuing along the very narrow lane. Go through the village of Bryn Pydew, continuing on in the direction of Llangwstenin until you see the entrance gate (marked SSSI) which is the entrance to the nature reserve. This nature reserve is open all year round. Limestone pavement is dangerous terrain and great care should be taken when walking is such places. The slabs (known as clints) of limestone can be very slippery when wet. Running between the limestone slabs are deep fissures (called grykes), and so good footwear is essential. It is possible to park along the lane close to the reserve but there are no other facilities there. There are shops, cafés and public toilets in Llandudno and Colwyn Bay. There are areas of unimproved limestone grassland with its associated plants throughout the reserve, including the slope below the car park. Look out for Common Rockrose (Helianthemum nummularium), Carline Thistle (Carlina vulgaris), Cowslips (Primula veris) and Dropwort (Filipendula vulgaris). 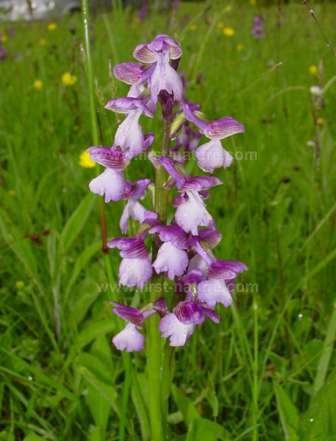 Also present on the reserve are six wild orchid species including Early Purple Orchid (Orchis mascula), Green-winged Orchid (Anacamptis Morio), Pyramidal Orchid (Anacamptis pyramidalis). Afew Dark-red Helleborines (Epipactis atrorubens) and Autumn Ladies Tresses (Spiranthes spiralis) also occur ion this reserve. Because the reserve is not grazed, trees and shrubs grow on the limestone pavement including Yew (Taxus baccata), Ash (Fraximus excelsior) and Holly (Ilex aquifolium). The grykes are home to plants normally found in woodland including Dog’s Mercury (Mercurialis perennis) and Hart’s-tongue Fern (Phyllitis scolopendrium). The woodland is a lovely place to visit in the spring when the Early Purple Orchids grow side by side with Primroses (Primula vulgaris), while in the specially-cleared areas there is also Stinking Hellebore (Helleborous foetidus) appearing in increasing numbers. The outstandingly diverse plant life at Bryn Pydew supports a wide range of invertebrates. There are 22 butterflies species and nearly 600 kinds of moths recorded from the reserve. Moths of particular interest include the Reddish Light Arches (Apamea sublustris), the Heath Rustic (Xestia agathina), the Cistus Forester (Adscita gryon) and the Chalk Carpet Moth (Helanthia procellata), the latter being at the north-west extremity of its range. There is also a small population of Glow-worm (Lampyris noctiluca) at Bryn Pydew. They feed on snails and, in the evenings of late June or early July, you may be lucky enough to see the greenish light that the female radiates in order to attract a male. 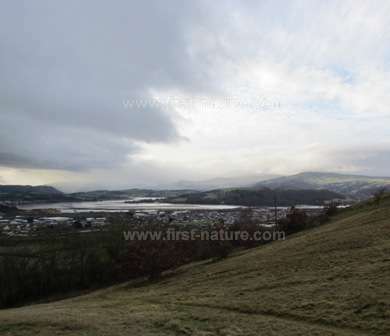 In late spring or early summer astroll through this lovely nature reserve, with its magnificent views over Penrhyn Bay, is a great way to pass a couple of hours among some of the finest wildlife and ecology in Wales.